Clear all 8 jellies and reach 10,000 points to complete the level. This level has medium difficulty. For this level try to play from top part of the board where more candies are available to play. 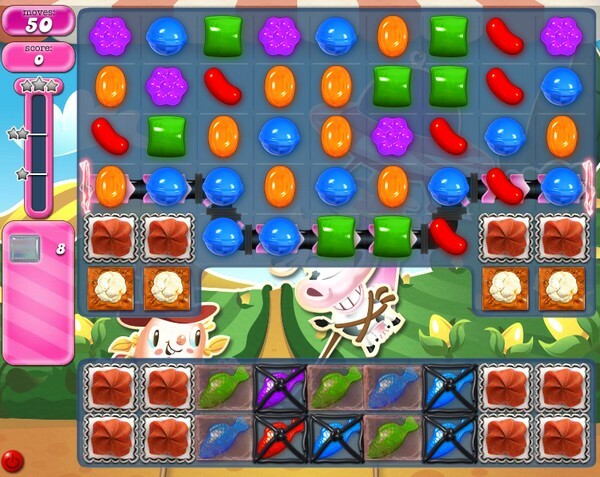 Make special candy and combine them with each other to break more blockers that are in bottom part of the board. This level has been cut from 50 to 17 moves…..I am sickened by their greed and how they are ruining a once fun game to make more money. SHAME!!! 2015 completed! 4 boards! Break iceing blockers & popcorn. I’m having a hate hate relationship with this level. My Jelly Fish are useless, when activated they clear candy on the top only. Never on the bottom. My fish will not eat the jellies on this level unless they’ve been uncovered. You can’t uncover the jellies without first popping the popcorn. Usually, by the time I’ve managed that, All the fish have already been set off, so they’re no longer available to eat the jelllies. There isn’t enough moves allowed to get striped candies with the right stripe direction in the right places with available support pieces to set them off to kill the jellies otherwise. It’s driving me batty. I don’t understand this game! I’m too old for this game I guess. I agree with comment above! My fish don’t attack the jellies, only other candies. Please fix this! I’m playing on mobiles! I even tried playing on the computer in the hopes that the fish would cooperate there… they still only attacked the candies at the top and other fish. I finally passed the level… I just don’t know how. I started a game when I first woke up, but was still groggy and not really paying attention (just getting the clock started), and I looked down and all the jellies were uncovered, even though the popcorns hadn’t been popped and the fish were mostly still intact. Wish I had seen what happened so I could pass on what you need to do to accomplish it. I’m glad I’m done with it, but I would have liked to be able to help everyone else who is stuck on this crazy level. (And I still have no idea why the fish behave differently than on other levels… if they just worked like normal, it would be fine). My game is not the same one tops are given for. Help!! !